With transit issues in Metro Vancouver having been the spotlight for essentially the past month and running, I’m sure the bulk of you have been waiting for me to make a comment or put something up on my blog. 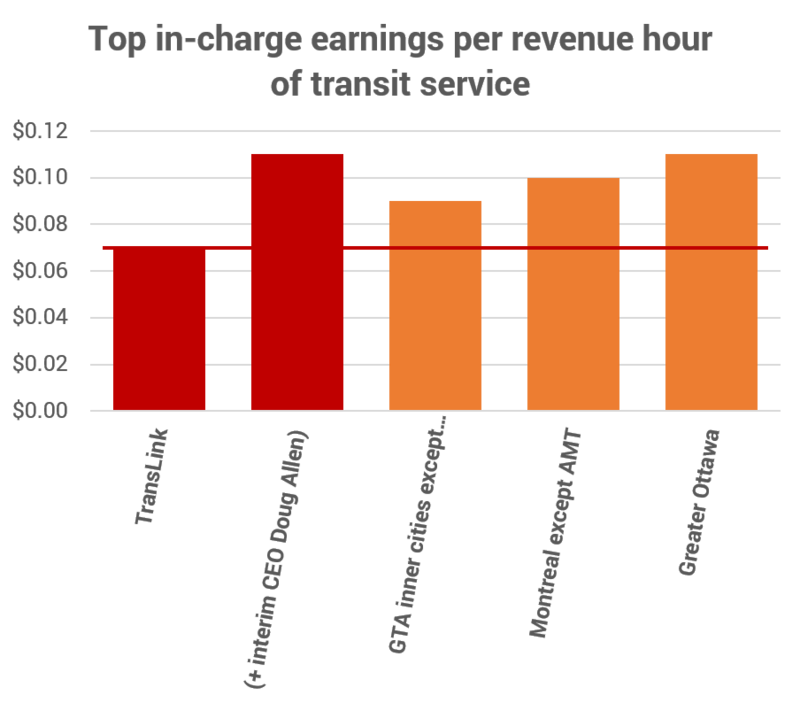 Now that I’ve had time to put together some data, let’s talk about TransLink and executive pay. It’s one of the main targets of the relentless “No TransLink Tax” coalition lead by the Canadian Taxpayers’ Federation and BC director Jordan Bateman. The coalition have wasted no time designing their website to capitalize on riders’ sentiments and paint TransLink as a wasteful organization, and the CEO’s high salary is at the front of the criticism. From the CTF’s “No TransLink Tax” website. 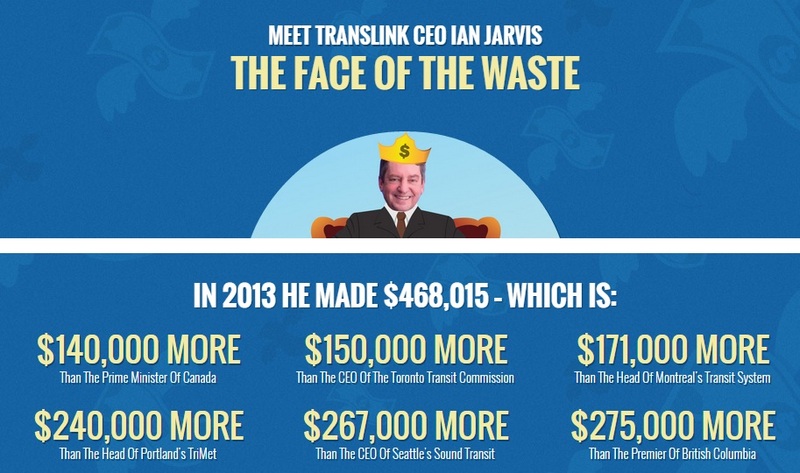 If you look at the image above, you can see Ian Jarvis’ salary is being compared to the salary of CEOs of other transit operators. How is it not disconcerting? An unelected in-charge, making over $450,000, earning this taxpayer-funded salary while managing a taxpayer-funded authortity, is not an attractive prospect by any means. Sound Transit is a name you might see when you drive into Seattle from Vancouver, because it operates the bus rapid transit routes and stations you see while driving on Interstate 5. They operates numerous express buses and some rail lines, but it’s not the largest transit operator in the Puget Sound nor by any means the one carrying the most ridership. That would be King County Metro, which operates Seattle’s inner-city buses and carries 4x the daily ridership that Sound Transit does. There was one recent “No”-side supporter I spotted on Twitter that did account for King County Metro’s existence, and criticized TransLink for paying its top 7 earners 212% of what the top 7 earners at either Sound Transit or King County Metro earn. However, TransLink still operates a wider variety of services over a larger service area, and our system carries more than twice as many daily weekday riders as both of the Seattle transit agencies put together (1.2 million on TransLink (source), vs 496000 between both King County Metro (source) and Sound Transit (source)). A quick look on the internet shows us there are many transit operators in the Puget Sound on top of Sound Transit and King County Metro. On top of the 9 listed here, Washington State Ferries is also a vital commuter link much in the way our SeaBus is. Each of these operators has their own CEO. Now, I’d like to focus on Toronto as another example of what I mean. In Toronto, there’s the TTC, which operates the subway, streetcar and bus routes inside Toronto city. Its CEO is Andy Byford, and he gets paid $150,000 less than Ian Jarvis. You could take that number for granted and think – “why do we need to pay our CEO that much more than Toronto pays its CEO?”. But what the CTF doesn’t tell you is that Andy Byford isn’t the only CEO of a transit authority in Greater Toronto. He’s actually one of nine CEOs. There is also a long-distance commuter rail network, but it’s maintained by a separate operator (GO Transit) with a separate fare structure and a separate CEO. On top of everything, there’s a TransLink-like authority called MetroLinx that’s responsible for: GO Transit, a region-wide tap-card payment system (like Compass), and decisions on capital-intensive rapid transit projects. There is, again, a separate CEO. Well, that’s one of the things the “No” side has failed to account for in its claims. In other cities in Canada, the moment you cross a city border and head into another city suburb, you need to transfer to different operator’s bus (which may even require an additional fare to ride).That hasn’t ever been the case in Metro Vancouver, as the transit administration model we’ve adopted is centered around consolidation and thus simplicity. You ride on TransLink whether you’re in Vancouver or in Surrey. You might have to pay for zones during some parts of the day, but you don’t ever have to pay two fares for two different systems. The TTC also has a smaller service area, because its services generally do not exit Toronto city limits and serve surrounding cities like Mississauga, Brampton, etc. TransLink operates Canada’s largest urban transit service area. Here in Metro Vancouver, we’ve had a single operator in charge of operating transit for the entire region throughout history. The B.C. Electric Railway provided rail and bus service as a single operator – so did B.C. Hydro when they were in charge… and then B.C. Transit’s Greater Vancouver division when that was incorporated. TransLink has continued the same advantageous, simple model – but expanded it by not just taking charge of transit but also taking charge of regional roads, bridges, pedestrian and cycling facilities, and other infrastructure throughout our region. I personally think it’s because this is what we’ve been used to for pretty much forever, that we take it for granted and never really consider or account for the benefits of this model. TransLink has become, to everyone else, just like any other transit agency – and when our CEO is being paid on the higher end of a six-figure salary, that’s considered in a very negative light even though we perform with 1 CEO what other metropolitan areas perform with 4-9 of them. Here’s the full spreadsheet data. The top-in-charge CEO salary numbers are up-to-date and were tracked down by various means (organization report, news report, etc.). Population counts are using more recent estimates by the city rather than the Census. Data is as of the year 2013. Notice how when I put up the per-capita measurement for the TTC’s CEO only, it comes up as a lot lower than TransLink and looks like a lot of a better deal. This is what I mean about it being a matter of perspective. If you compare the TTC (the inner-city transit operator) only, it definitely looks great. But that’s because you’ve left out GO Transit’s commuter rail service into Toronto; you’ve left out Metrolinx; and you’ve left out all the other transit operators in the suburbs that surround Toronto city. At this point, it’s not just a matter of who’s got more influence on the general public, but also about how they’re exercising that influence. For one, the leaders behind the “No TransLink Tax” effort have decided to tell us one thing and not tell us the other. They’re trying to convince us that TransLink is even comparable to Toronto’s TTC, Montreal’s STM and other individual city transit agencies when that is simply not the case. They’re outright lieing to us, and we don’t even know it because the concept of TransLink as a unique, single, region-wide entity – and advantageous because of it – has not been established with the voter base. The CTF has criticized TransLink for excessively having 6 different ‘boards of directors’ within its structure. But, other metropolitan areas in Canada can have 6 or more different transit operators, each with one or more ‘boards of directors’ within them. The CTF has criticized TransLink for an “excessive” amount of staff making salaries over $100,000. About 430 people on TransLink make salaries of over $100,000. By comparison, Toronto’s TTC alone has nearly 1400 employees making salaries of over $100,000 – and there are more such employees at GO Transit, Metrolinx, and Greater Toronto’s other transit operators. At Montreal’s STM, 252 employees on senior-level staff alone are earning six-figure salaries – notwithstanding security inspectors and non-executives, as well as employees at Laval (STL), Longeuil (RTL) and the regional AMT, who may also be earning six-figure salaries in greater Montreal. The CTF has criticized TransLink for having 66 of its 177 transit police officers make over $100,000. By comparison, Toronto doesn’t have a dedicated Transit Police force, but of the city’s civil servants who share the responsibility of patrolling transit along with the TTC’s transit special officers force, more than 40% make salaries of over $100,000. That’s 2983 police officers. The CTF has claimed that the amount of costs TransLink can cut will pay for the improvements outlined as the referendum outcomes. Proceeding with taming the CTF’s alleged “inefficiencies” would raise only about $1.9 million annually, less than 1% of what is needed to proceed with the $7.5 billion, 10-year plan. The CTF has claimed that we don’t have to worry about revenue sources because revenue growth among TransLink, Metro Vancouver and the 21 municipalities is projected to increase at 4.8% a year over the next decade. If the expenses being borne by the region – which the CTF seems to have ignored completely – weren’t also projected to rise at this rate or faster than, then there wouldn’t be a need for a transit referendum in the first place. I’m honestly not sure, considering how much leverage the “TransLink is wasteful” message has on the public, how many people would be tempted to believe it if I were to say that TransLink is actually the most cost-efficient transit agency in all of Canada. Especially with the breaking news that TransLink is now paying two CEOs as Ian Jarvis has resigned, but is continuing to earn his existing salary as an advisor (notwithstanding that he won’t even be getting a severange package). Fuel into the fire for the no campaign. But, the numbers as I have presented above just do not lie. Even when interim C.E.O. Doug Allen’s pay is also counted, residents of Metro Vancouver are paying less per capita for their top-in-charge than residents of Canada’s other large cities. And under normal levels we pay our CEO less than the other operators do per amount of transit service they manage. 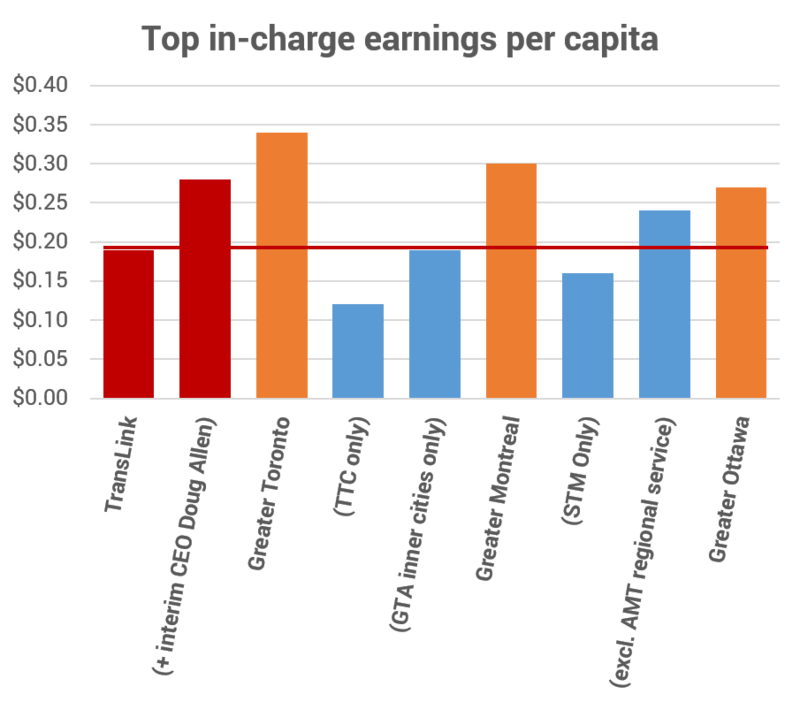 In CEO pay per capita, Metro Vancouver and TransLink are matching or thoroughly outperforming Greater Toronto and Greater Montreal, even if you don’t include the separate operators of the commuter rail lines heading into the city from suburbs. Many sources have already jumped on board the efforts to debunk clearly misleading numbers released by the CTF, “No TransLink Tax” and Jordan Bateman. Which had me raising a question of what the “No” side might have done in response to them, and how they might respond to this article. Well, if it gave me any idea, Bateman is continuing to use the faulty “cost per revenue passenger” comparator that I previously debunked on my blog in 2013 in the article, “Was TransLink Audited Correctly?“. Anyway, I really, really wanted to get this blog article out earlier but with trying to balance my blog efforts with my abroad study life and other issues, it took me about 1 month to gather all the data. Look forward to more referendum involvement from me and this blog soon, though! Your continued support and maybe a donation (link above) would help me keep things up! This entry was posted in Metro Vancouver transit issues, Series: No credit for TransLink and tagged BC politics, British Columbia, Greater Vancouver, issues, Metro Vancouver, Metro Vancouver transit issues, politics, rapid transit, referendum, SkyTrain, transit, transit funding, transit planning, transit referendum, TransLink, transportation, transportation planning, urban planning, Vancouver. Bookmark the permalink. Even under a single operator it costs an additional fare to ride transit here if you’re outside of Vancouver, but perhaps for the sake of argument we’ll just pretend the zone system is a single charge. As I mentioned, however, zone fares are a little more flexible in that they don’t apply at all on evenings, weekends and holidays. So in Vancouver you’d pay $2.75 on Saturday to ride what would cost $7 on any day in Greater Toronto. Sorry Daryl, the argument that you “pay less to ride transit on weekends and outside core hours” is completely irrelevant to the issue for the commuter who only takes transit to and from work. It doesn’t matter if rides are free outside core hours or not, it still costs a commuter $5.75 each way from Surrey to downtown Vancouver. No James Sommerville it doesn’t. A 3 zone fare during weekdays is $5.50 only if you pay cash both ways, but why would you as you can buy a day pass for $9.75 making it roughly $4.88. If you buy a 3 zone monthly pass and assuming you ONLY travel Mon-Fri to work and back home it would then cost $4.25. If you buy books of 10 3 zone faresavers and use 2 per day it only costs $4.20. The London Underground has six zones and a graduated fare scale. Far from avoiding it, millions a day take it and a large part of the traffic to the centre originates frmo the exurbs. It’s simply cheaper than running a car. Seems like you’re only argument for translink has to do with executive pay. Not sure if you included the cushy $1000 monthly bonus they get to not ride transit at all. You’ve avoided the real issue people have with translink and it’s one of trust. Closed board meetings has led to a culture of distrust among residents who were against increasing funding for transit police ($40m a year) and who were shocked to find out the cost over runs for the 2 year delayed compass card system (approaching $50 million). It’s easy to get lost in executive pay because it’s a current issue now they are paying two. It’s not that people are necessarily against a tax, many feel that before translink gets anymore public money they need to show they can be trusted. Also, the money being raised through this referendum is not going to TransLink. TransLink isn’t even on the referendum ballot. There is no possibility that they will take this money to waste or raise executive salaries further because they’re not getting it. The province is collecting this money as a PST extension, to be distributed among the referendum outcomes outlined by our Mayors. The “No Vote” side is already misleading us with the premise that this is a “TransLink tax”. It seems, Winston, that you don’t understand history and missed the whole point of Daryl’s rebuttal to the half-truths and cherry-picked data espoused by the No side. For you to carry on regurgitating the executive Fat Cat myth you will have to do a point-by-point analysis at least as thorough as that above by comparing TransLink to other transportation organizations. Further, you need to put the blame for Compass and the unelected board structure where it belongs, at the feet of former transportation minister Kevin Falcon who imposed unneeded fare gates and who kyboshed the local democracy TransLink used to possess. TransLink therefore has become the straw man propped up by the provincial government to take the flak dished by uninformed people. Funny how well that works. You may be tempted to say the private sector could manage $10 billion in assets better than TransLink. I challenge you to find private executive remuneration in other large transport companies lower than TL’s, especially considering the preferred share holdings, unaccounted for corporate perks and serious conflict of interest issues presented with multiple directorships in companies doing business with the transport organization. ‘Research’ is not a dirty word. In fact it’s healthier than issuing lazy, unreferenced opinion. I have no idea why, why on earth that the simpletons of the lower mainland and for that matter the entire province of BC are so stuck upon allowing criminals to take their money. Just a little ridiculous to me Can anyone anyone at all tell me why the BC people are so simple as to want to pay first of all a increased tax, and then pay again when they use translink amenities. The world, at least the smart world, does not pay twice for something, or maybe the people would like to buy some land I have in Mississippi. I now know that I should open a business in BC cause the people of BC are so intent upon paying twice for something. Oh yea, and all I have to do is call it a tax. Yup pure and absolute insanity. No wonder they continue to vote in the government s they do in BC instead of overthrowing the EVIL and and creating a true form of Socialist government. In response, it might help your insight to realize that all North American transit operators are supported by a mix of fares and taxes (and people who pay fares do pay both!). That’s… I guess you can say… standard-fare. And it might help your insight Daryl to be reminded that while “North American transit…are supported by a mix of fares and taxes” that the CEO’s of those transit systems are paid significantly LESS than the CEO of TransLink. James, references and research please. Ron, insults do not help your argument. Perhaps you should do a simple calculation of the total cost of car-oriented infrastructure, accidents, litigation, environmental damage, etc. Compare that to transit costs, and be prepared for a light bulb moment. I’ll make it so light a simpleton can understand it: transit is orders of magnitude less costly to society and the public purse than Autotopia. Whose paying twice? I buy a 2-zone bus pass and that’s it–subsidized by $1.66 per trip (I like that one). People who buy “stuff”, including foreign holidays, cars, and gas & repairs for their cars) will be paying the 1/2 percent. I don’t buy stuff–I don’t have time to shop, I work, and with my bus pass I can get where I want for excursions. The simple life is where transit can take you. Helping move talented people around to employment that suits them and living-spaces pleasant to live in is not a bad investment for purchasers of goods and services. Why’d you buy your land in Mississippi? Ridiculous, simpleton, insanity. And “twice” means YOU count two sets of people as if they are one. Daryl, an excellent article. Thanks for your clarity. If what you said is true, why is it so difficult for Translink to bring up this idea to the public? That Ian Jarvis was 1 CEO, vs. 1/2 dozen CEOs in other jurisdictions? Couldn’t Translink make this simple analysis? Or are there still other factors? Who knows. At this point, they’re under a lot of scrutiny. Since the opponents were already lying to get to their widely accepted points, who’s to say they wouldn’t keeping skewering things in their further responses. TransLink has to run transit, and even I’m not sure if it should be in their position to actively wage a war with these opponents, which might just not go anywhere useful. 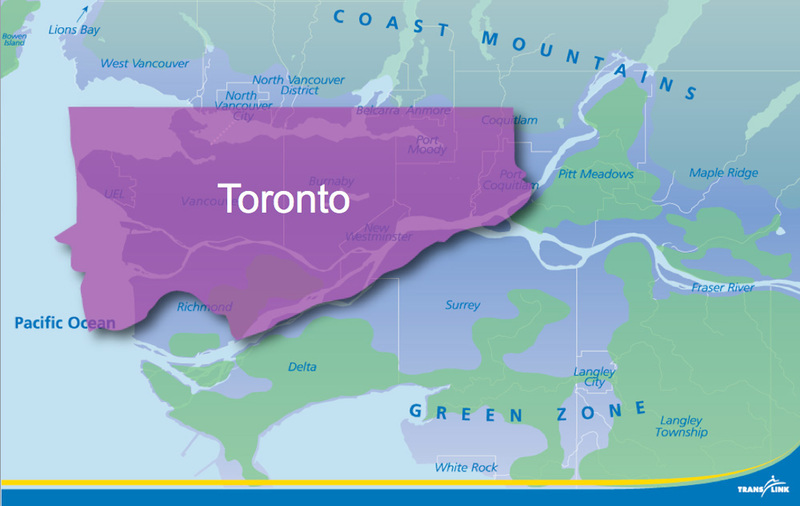 However, the image in this article showing Toronto’s service area against TransLink’s was taken from a The Buzzer article on the matter posted several years back. They also compared Chicago in that article. Correction: The Downtown Seattle Transit Tunnel only has two agencies in it: Sound Transit and King County Metro (who are contracted to run both the light rail and express bus in the tunnel under the ST brand). To see the only other transit agency operating in Downtown Seattle, Community Transit of Snohomish County and their commuter express routes that sometimes feature double-decker buses, one would need to be on 2nd or 4th avenue during rush hour. Thanks for the clarification on the transit tunnel; I’ll be amending that immediately. You need to add some other salaries to the local mix: Canada Line, Port Mann bridge and Golden Ears Bridge are all separate operating companies. Current interim CEO of Translink used to be CEO of Canada Line. The operators I’m comparing likely also have their subsidiary operators, but to look into that would go aside from one of the main points which is to illustrate that the “no” side, who love to focus on our top-in-charge, has been distorting perspectives here in Vancouver. Anyway, two of the subsidiaries you listed aren’t transit-centric at all. I honestly feel like even this comparison could be a stretch since TransLink just isn’t the typical kind of authority (i.e. the TTC doesn’t maintain regional roads or pedestrian and cycling facilities). But, it is what it is. It’s ridiculous to argue based on per capita, since it would mean the prime minister should be the highest paid person in Canada because he is serving the whole country or the CEO of the company with the largest number of customer should get the highest pay even if the company makes little or no profits. It’s just a job and similar jobs should have similar pay. You can allow for difference in pay because of individual qualifications, experience and/or education. That’s not really the point. I’m not really trying to justify the pay levels in this article, so much as I’m using “per-capita” in the argument here to establish a fair, proper context that the “vote no” side have been avoiding altogether to distort our perception of TransLink. The “per-capita” argument is completely irrelevant to pay levels and you might pause to consider THAT is why the ‘NO’ side didn’t waste their time addressing irrelevant trivia. A few other comparisons you attempt to use to justify/explain could also be categorized as nothing more than a feeble attempt to justify TransLink’s excessively high salaries, such as ‘salary as a function of hours of operation’ or ‘salary as a function of population’. Taking both to their logical conclusion, if transit ceases operation at, say, 1:00 am, the CEO would get a salary increase if operation was extended to 2:00 am? Or, if the population in the defined transit area increased by, say, 200,000, that would be sufficient to trigger a salary increase? Bizarre! James, per capita and service hours are justified measures when determining the quality of the service being paid for in different cities with different needs. This is an especially relevant context when also comparing direct salaries. They neer to be taken together. When a city expands in population so does the cost of servicing them, especially if they are car-dependent low density sprawling subdivisions which have a far higher per capita public cost and lower per capita service hours due to that cost. Overal metropolitan per capita measurements would leaven the more efficient inner city stats with the peripheral numbers. You also missed the bit about the ineffiencies of having transit AND roads managed by one outfit, unlike any other transport organization on the continent. John, we would need more than one PM for that comparison. As it happens there are several transit agencies who offer similar services in our cities and Daryl has offered several statstical methods to leaven and compare them. Per capita and per service hour analysis are completely legitimate when combined and tend to reduce or even eliminate the rampant cherry picking we’ve seen so far from the No side. I do have a simple question for you Daryl. Do you currently live and pay taxes in BC and take our public transit? I don’t know how this matters at this point and I know you’re trying to upend me just because I don’t happen to be in Metro Vancouver right now due to an exchange program. But yes, I’ve been a frequent rider of public transit throuhgout our metro, I’ve lived in Metro Vancouver and will continue to do so when I am back from Japan. You’re just going to have to believe what I say at this point. But do you pay income tax here, sales tax here? I want to know if you perspective is from someone who already pays 10’s of thousands of personal tax dollars (not an exaggeration) in BC or someone who doesn’t. It changes your perspective on the issue significantly! I want to vote yes, but I have major trust issues with how the money will be used as Translink is by far one of the most fiscally irresponsible organizations out there. I regularly talk to multiple employees who work there that verify this opinion frequently, they don’t listen to their employees, they don’t listen to their customers so I have a hard time justifying giving them more money. It’s also very easy to argue for a tax increase that won’t impact you directly right now, interesting enough all of BC will pay for this increase so I doubt many people outside of will be pleased that only Metro Vancouver residents get to vote on a PST increase (assuming they administer it as they say they will). You are wrong on several points, Terry. It’s obvious you never read Daryl’s post or understand the issues. The transit tax will add a whopping 1/2 of 1% to the PST. I for one will happily pay my 7 1/2 cents on a $15 bottle of wine to see transit vastly improved all over metro Vancouver. The additional tax will be collected only in the metro, not throughout the entire province and will be used for metro projects. The funds by the rules set out in the plebiscite will be placed in a transparent account and audited annually. These facts have been repeated over and over again. How you missed them says a lot. Terry, do YOU take transit?, and what do you think?, good? I ride to and from work, If I took a car I could drive it in 30 minutes, but I bus/ skytrain/ bus it in 35 minutes. I’m so impressed. It’s packed, mind you. A lot of people appreciate the system. Do you ride transit Terry? So you want us to pay even more money to one of the most misguided and mismanaged companies in Canada? You say it doesn’t go to translink and that they aren’t on the plebiscite however when translink is the only corporation managing the problem, where else is the money going then? To fund their projects that will cost over run and eventually cost us even more money? Vancouver is one of the most expensive places to live in the world and you want it to cost even more? We pay the highest gas prices in the country, over 20 cents a litre more than Toronto and 30 cents more than even Saskatoon, to leave the gas rich Alberta out of the equation. So we should pay more to translink? I pay more than 20 cents a litre in gas tax to Translink and never use the bus or their major “projects”, and now i should pay more? Toronto TTC gets 60% of their funding from ridership, Translink gets 32%. 60%of Translink expenditures are to transit and 8% to roads. Seems like they should charge more to ride the bus or train to get their cash flow and start actually getting money from the people of Vancouver that live here part time and don’t pay our property taxes and gas taxes or income taxes. I won’t ever pay a corrupt corporation more money so they can throw it away and squander it on paying 2 CEO’s now after they “fired” one and an unelected board or morons making selfish and political decisions. Fix Translink and make them politically accountable and elected and then we will see some progress. Only then can you talk to me about funding.